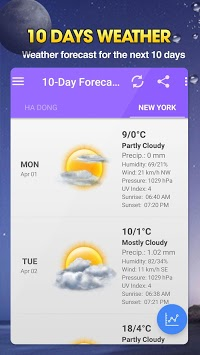 Weather app is an indispensable application for every android phone. Every day when you go out, you want to know what the weather is and what you wear for the day to suit with the weather. It will be easy with our free weather app. 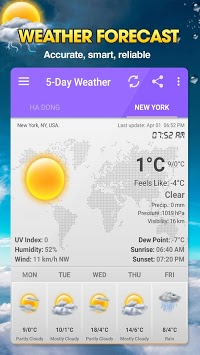 The weather app is designed for extremely easy to use android devices. With a nice and friendly interface it will be your companion everywhere at all times. Weather live will bring you many other great features. What are you waiting for without downloading this free and convenient weather app.